These days a flare for me is a single day with no energy. When I’m in a flare, I don’t leave my PJs, I don’t shower and I rarely work. I do, however, rest, relax, recover, and enjoy catching up on some TV. Most of the time lately these days fall on Sunday or Monday because I stayed out too late on Saturday and/or I just did too much over the weekend. I know that doing that will result in me doing nothing on Sunday, but I’m OK with it. Sunday is my relax day, but there’s a difference between a relax day and a flare day. A flare day requires a little more TLC, and a few special items. Hot Tea – I love a good mint tea, or a ginger tea. My new favorite tea lately though is Numi Organics 3 Roots Tea, with ginger, turmeric, and licorice. It’s soothing and tastes really good with a little honey added (I typically add a little honey to most teas). Heating pad – Even though most of my flare days don’t typically include excess pain, there are times when it does. The area that tends to bother me most is my neck and shoulders, so I’ve been using my Relax Wraps re-heatable hot/cold therapy pad a bit more. A blanket – When I’m not feeling well I’ve got to have a comfy blanket to wrap up in. I’ve got several in the living room that I really like, a lighter one for when I’m not really cold just want to cover up, and heavier ones for when I need to warm up. Fay Farms CBD Muscle Rub – When my shoulder or neck is acting up (or well anything hurts), I kind of live off of this stuff (or well I guess I live with this stuff on me). As I type this my shoulders are slathered in it. Oska – It’s a bit unfair to include this in my flare survival kit as it’s really something I rely on daily. But, when pain flares up I do find that I turn it on a bit more often. Netflix / Amazon /Hulu – (aka good TV) I don’t know where I’d be without streaming television. I gave up cable a few years ago and it’s been a really good choice. With the various streaming options there’s always something good to watch.I try to find something funny that will keep me entertained. I enjoy light-hearted sitcoms as well as random competition shows like Cupcake Wars and, lately, Making It. Tablet/ Kindle / Smartphone – When I’m not feeling great the last thing I want to do is look at my computer, but I can deal with my tablet. It’s great for keeping up with social media, reading a book, playing poker, and checking my email. If I’m laying in bed and don’t feel like dealing with the TV I can even watch streaming video on it. Epsom salt baths – I take a bath with Epsom salts often before bed, but when I’m not feeling well I’m likely to climb in one in the middle of the day. It’s relaxing and the salts help ease muscle tension. Patience – I have to have patience with myself if I want to get through a flare. If I push myself too hard or I’m not willing to just ride it out, the flare will last longer. 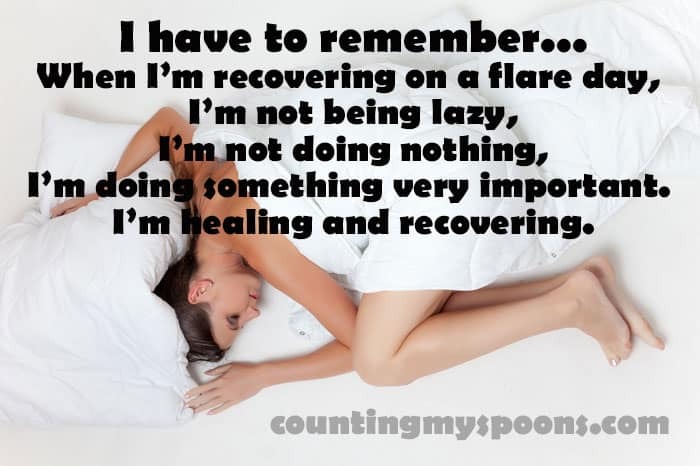 Resting isn’t easy but as the meme that’s been going around says I have to remember that when I’m resting I’m still doing something very important – I’m healing. Chocolate – What? Did you really think I’d leave off the most important thing? Seriously. Chocolate is my comfort food. I may have given up gluten, dairy, and eggs but you’ll pry dark chocolate (usually in the form of Trader Joes Pound Plus with Almonds bar) from my cold dead hands. Water – Hydration is one of the most important things I’ve found for keeping flares short. I’ve also found that not staying hydrated is often a culprit in landing me in a flare. So, when I wake up feeling bad I fill up my large water bottle and drink it down… then do it again. Recently, I’ve also learned that electrolytes make a big difference. Adding them to my water helps keep me hydrated and gets me hydrated faster. I really like the Ultima electrolytes because they don’t have artificial sweeteners and other crud I try to avoid. 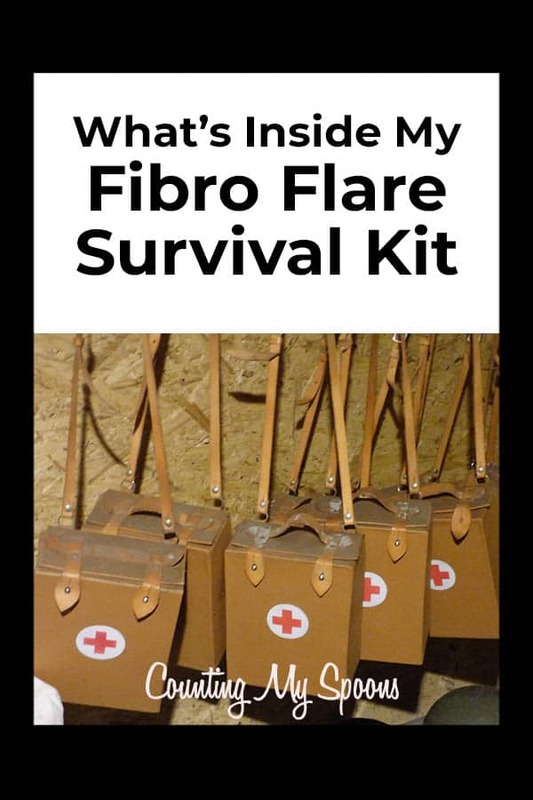 So, now that you know what’s in my flare survival kit, leave a comment below and share what items you can’t live without during a flare.